Background The Smoke-free Environments Regulations 1999, under review in 2005, specify tar and nicotine be tested by the ISO machine smoking method. Reports from other countries suggested that this method tended to under report the amount of smoke (and therefore of nicotine and tar) in comparison with the amount of smoke actually inhaled by the average smoker. The portable Cress Micro transducer with mouthpiece and cigarette holder (Plowshare Technologies USA) enables study of smoking in natural outdoor non-laboratory settings, without distorting natural smoking patterns.1 It measures total smoke inhaled per cigarette (total puff volume TPV), puff volume, average and peak airflow, and inter-puff interval. 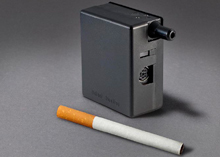 The device (6.5 x 5.5 x 3 cm, battery operated- see Figure 1) records insertions and removals of a cigarette, and records volume, interval, and duration of puffs for later uploading to a computer. It disregards miniscule false puffs, a problem with an earlier prototype. The puff count for 100 mm cigarettes was scaled to a standard king size cigarette 83 mm (65 mm rod). The Cress Micro is capable of measuring puffs taken from cigarettes. RYO cigarettes require a filter, and e-cigarettes may need an adaptor, to enable them to be fitted into the Cress Micro. The device is registered to be down-loaded on to just one computer. Figure 2. Comparison smoke inhaled per cigarette, New Zealand and US smokers, versus smoke machine. New Zealand male smokers n=5, smoking 10 cigarettes of 0.5 to 1.1 mg nicotine yield. Laugesen M. using Cress Micro transducer, 2005. Preliminary unpublished data. · The preliminary Health New Zealand data agrees well with research from the American Health Foundation New York. · The observed total puff volumes per cigarette correspond closely to the total puff volumes obtained by Health Canada intensive method for a regular Marlboro cigarette. · The Health Canada method is a better guide to the average smokers’ behaviour than is the ISO method. · The ISO test, the test currently used, greatly underreports cigarette smoke yields. · The ISO test method underestimates the exposure to cigarette smoke of those tested by at least half. - Health New Zealand preliminary data, using Cress Micro transducer, 2005. The average smoker took 47 ml of smoke per puff; whereas a machine working to ISO specifications, is programmed to take 35 ml less of smoke per puff. ISO method (the lower straight line in Figure 1) underreports the smoke by 30%. This graph shows that the ISO method corresponds to the lowest puff volumes recorded among 11 cigarettes smoked. Health Canada’s intensive method requires 55 ml puffs to be taken by the machine every 30 seconds. As Figure 1 shows, this method would be more in line with the way the mainly young adult males we tested, actually smoked. The average smoker took a puff every 23 seconds. An ISO-programmed machine will take a puff every 60 seconds. Add on the average 1.6 seconds for the duration of the puff itself, and the machine should be taking one puff every 25 seconds. This underestimates the amount of smoke by 58%. ISO method. A smoke machine under ISO conditions, as NZ cigarette testing regulations have required since 1999, takes a puff every 60 seconds, with an inter-puff interval of 58 seconds. Health Canada intensive smoking method (puff every 30 seconds, inter-puff interval 28 seconds) provides a more realistic way to test cigarettes than the ISO method as currently required in regulations. Health New Zealand preliminary data, 2005. The average smoker took a puff of average duration 1.6 seconds. Smokers’ 3rd puff was on average deeper (see above), and lasted just over 2 seconds. All other puffs were shorter than the machine method specified. Machine methods. Both methods specify a puff lasting 2 seconds. Whichever machine smoking method was used, the machine would overestimate duration of the puff by 20%. 1 Lee EM, Malson JL, Waters AJ, Moolchan ET, Pickworth WB. Smoking topography: reliability and validity in dependent smokers. Nicotine Tob Res 2003; 5: 673-9. 2 Djordjevic MV, Stellman SD, Zang E. Doses of nicotine and lung carcinogens delivered to cigarette smokers. J Nat Cancer Institute 2000; 92: 106-11. 3 Counts ME, Morton MJ, Laffoon SW, Cox RH, Lipowicz PJ. Smoke composition and predicting relationships for international commercial cigarettes smoked with three machine-smoking conditions. Regulatory Toxicology and Pharmacology 2005; 41: 185-227. © Copyright Health New Zealand 2005. All rights reserved.